CAMBRIDGE, Mass. 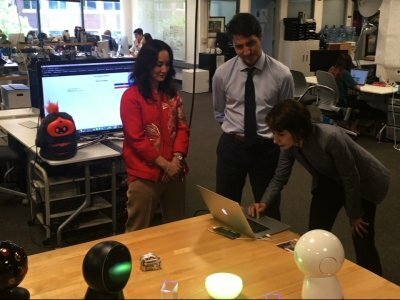 (AP) — Canadian computer scientists helped pioneer the field of artificial intelligence before it was a buzzword, and now Prime Minister Justin Trudeau is hoping to capitalize on their intellectual lead. “We’ve been investing massively in AI,” Trudeau told a conference of tech entrepreneurs Friday at the Massachusetts Institute of Technology, before name-dropping several of the Canadian academics he said provided the underpinnings of the technology during an “AI winter” when most weren’t paying it much notice. Trudeau has become a kind of marketer-in-chief for Canada’s tech economy ambitions, explaining the basics of machine learning as he promotes a national plan and government investments to “secure Canada’s foothold” in AI research and education. He said Friday that Canada is making a “deliberate choice,” but not an easy choice, to embrace change at a time when new technology is disrupting workplaces and leading to anxiety and fear about the future. He said leaders also have a responsibility to shape the rules and principles to guide the development of artificial intelligence. His visit headlined MIT’s Solve initiative, which connects innovators with corporate, government and academic resources to tackle world problems. He also spent time visiting a technology lab, chatting with engineers and asking pointed questions about hydroponics, neurology, robots and kids’ coding programs. Trudeau isn’t the only head of state talking up AI — France’s Emmanuel Macron and China’s Xi Jinping are among the others — but his deep-in-the-weeds approach to promoting Canada’s knowledge-based economy has caught U.S. tech companies’ attention in contrast to President Donald Trump, whose administration “got off to a little bit of a slow start” in expressing interest, said Erik Brynjolfsson, an MIT professor who directs the school’s Initiative on the Digital Economy. Facebook, Google, Microsoft, Uber and Samsung have all opened AI research hubs centered in Montreal, Toronto and Edmonton. They were drawn in large part by decades of academic research into “deep learning” algorithms that helped pave the way for today’s digital voice assistants, self-driving technology and photo-tagging services that can recognize a friend’s face.